3 Bedroom Terraced House For Sale in Milton Keynes for Asking Price £319,995. 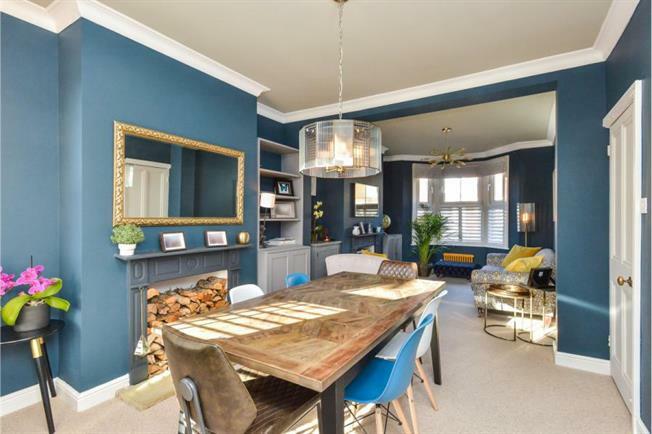 This 3 bedroom Victorian mid-terrace has been lovingly refurbished by the current owner and has managed to merge both traditional and modern in this stylish home. Benefitting from a new kitchen, fully re-plastered and re-decorated throughout, new flooring, new bathroom, new combi boiler, carefully restored features including: period radiators and original fireplaces. These properties are highly sought after due to their spacious lay out and excellent location. Within a short walk of Bushfield School, train station and Victoria park. the property is walking distance to local shops and amenities offering a host of local specialist independent retailers and both TESCO's and ASDA. Wolverton has a cosmopolitan feel and a popular location for families and is quickly becoming a commuter hot spot thanks to its charm and fast rail links offered by its mainline train station. The accommodation comprises entrance hall, lounge/diner, kitchen/breakfast, utility room, three bedrooms and an upstairs bathroom. This property also benefits from gas central heating, double glazing, garden and a cellerette. Back door opening onto the garden. Radiator, bare brickwork. Wall and base units, single sink with mixer tap and drainer, integrated fridge/freezer. Double glazed uPVC window facing the rear. Space for Washing machine, tumble dryer and dishwasher. Doors leading to all bedrooms and family bathroom. Double glazed uPVC window with opaque glass facing the side. Radiator, part tiled walls. Low level WC, panelled bath, wash hand basin. Front Small front garden with path to front door. Enclosed by dwarf wall . Rear Path to gated rear access leading to parking area. Paved patio. Lawn area.